Each of the books in Nathan Hale's Hazardous Tales has elements of the strange but true and is presented in an engaging, funny format, highlighting the larger-than-life characters that pop up in real history. Big Bad Ironclad! covers the history of the amazing ironclad steam warships used in the Civil War. From the ship's inventor, who had a history of blowing things up and only 100 days to complete his project, to the mischievous William Cushing, who pranked his way through the whole war, this book is filled with surprisingly true facts and funny, brave characters that modern readers will easily relate to. 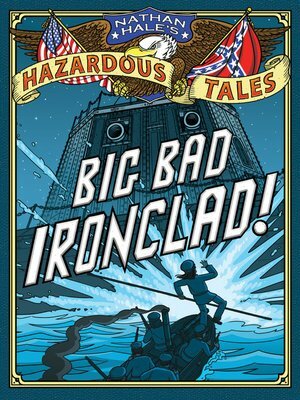 "Livelier than the typical history textbook but sillier than the many outstanding works on the Civil War available for young readers, this will appeal to both history buffs and graphic-novel enthusiasts." "Readers interested in American history will enjoy these graphic novels... Comic panels of varying sizes enhance the real-life events and support the stories' over-the-top humor... the writing is accessible and entertaining; author Hale's style gives readers an insider-y, you-are-there-type scoop."